FIBER GROW POTS Made of 100% Peat-free renewable coir Seeds and cuttings flourish in these - biodegradable fiber grow pots Less mold growth and they can be planted Coir is a fiber between the Coconut husk and- the outer shell of the Coconut Natural in color 0225 2.25 IN. RD FIBERGROW POTS SIZE:2-1/4" DESC:12 Pots per Pk. 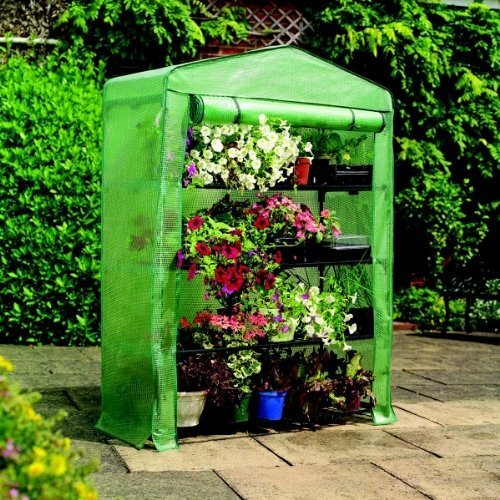 4-Tier Extra-Wide Mini Greenhouse is 5'3" high x 1'6" wide x 19" deep Ideal for limited spaces Includes Shelving wall fixing rings and guy ropes Reinforced PE cover Metal tubular frame. This item cannot be shipped to APO/FPO addresses. Please accept our apologies. 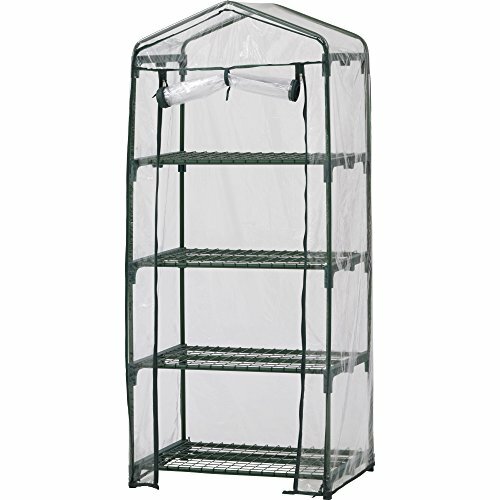 4 Tier Mini Greenhouse with heavy duty cover is 5' 3" high x 2' 3" wide x 1' 6" deep. This item cannot be shipped to APO/FPO addresses. Please accept our apologies. The Bond Bloom Greenhouse is the ideal way to kick-start your growing season. The heavy duty wall construction helps to create growing conditions that suit your plants and vegetables. The secure polyethylene roof and wall creates maximum solar performance as your seedlings rest on four ventilated shelves. 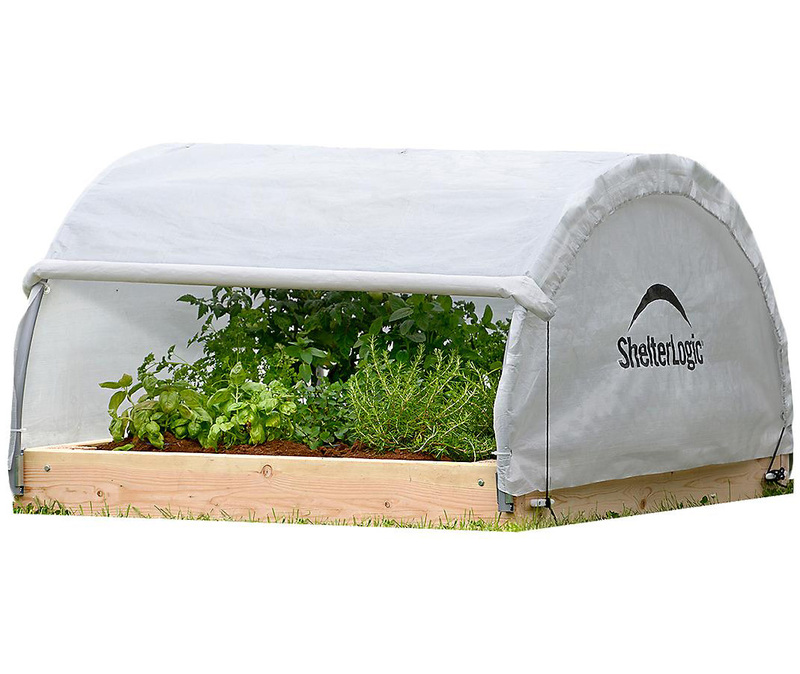 Our Early Start™ 4-Shelf Greenhouse is ideal for the urban gardener, beginner or hobbyist. Once your plants have sprouted, you can transfer them to your larger greenhouse. Great for herbs. Convenient size for the deck and patio. 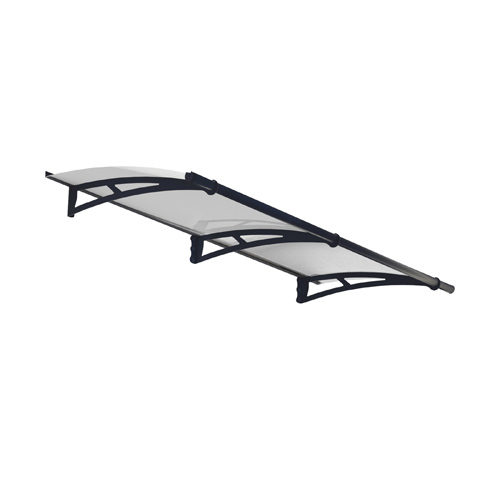 Transforms into an attractive year-round plant shelf by simply removing the cover. Interlocking components for eassebly in minutes. Strong aluminum framework, crystal clear unbreakable polycarbonate panels and galvanized steel base included. Wide and high entrance with double doors you can lock. Four adjustable windows for excellent ventilation. Ensuring the safety and stability of your Palram Nature Series (Mythos, Hybrid, Essence) greenhouse has never been easier. 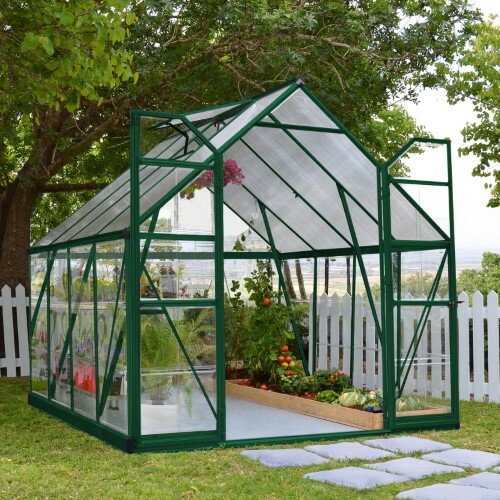 Proper anchoring is the ultimate way to prevent your greenhouse from becoming damaged from unstable weather, even if you don�t live in an area prone to high winds. 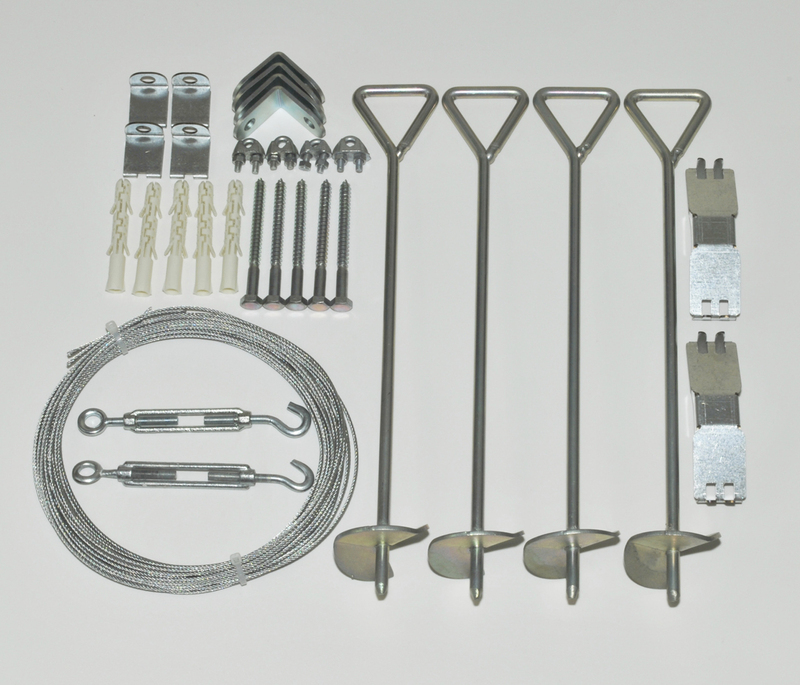 The anchoring system offers the most effective, lightweight and economical solution to anchor your greenhouse. Arcadia Carport Patio Cover. Protect your vehicle or patio from harsh elements including sun, rain, snow and hail with this attractive structure. The Arcadia covers and area 11' 1" x 16' 6" and is versatile enough to also be used as a patio covering for your backyard or by the pool. 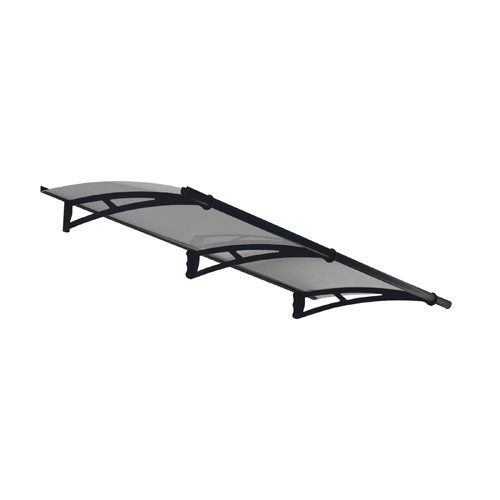 The virtually unbreakable clear polycarbonate roof protects from elements. Easy to assemble with two people and requires no special tools. Virtually unbreakable clear polycarbonate panels provide UV protection and limit exposure to rain, hail and snow. Polycarbonate panels provide UV protection and limit exposure to rain, hail and snow. 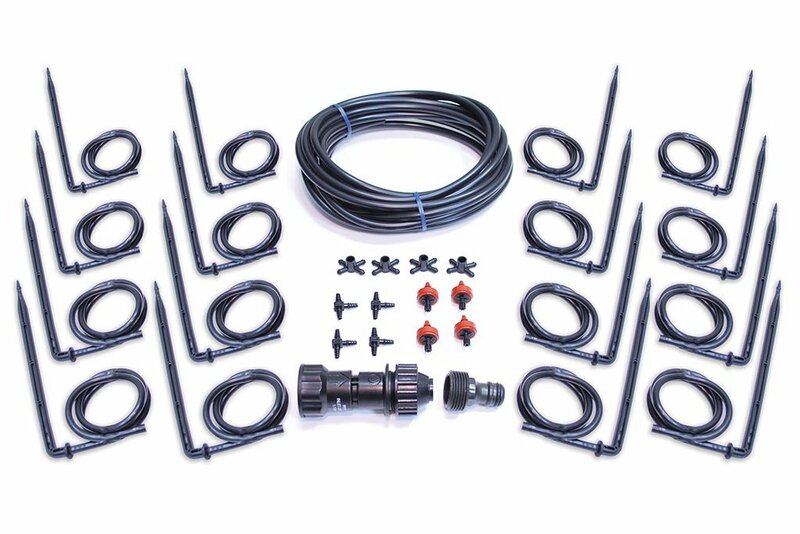 Control the flow of rainwater away from your vehicle or patio and route for drainage collection. 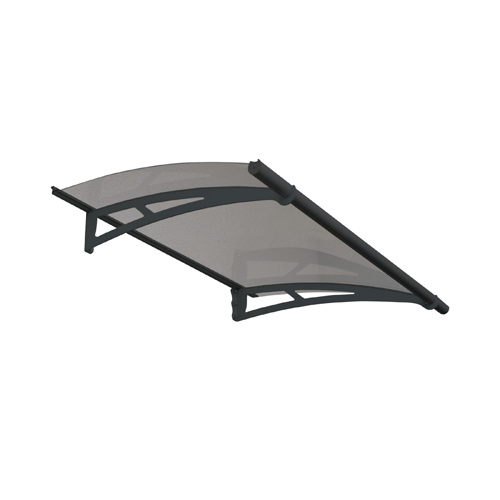 Use as a carport or patio pavilion, or both! Arcadia is easy to unassemble, move and re-assemble. 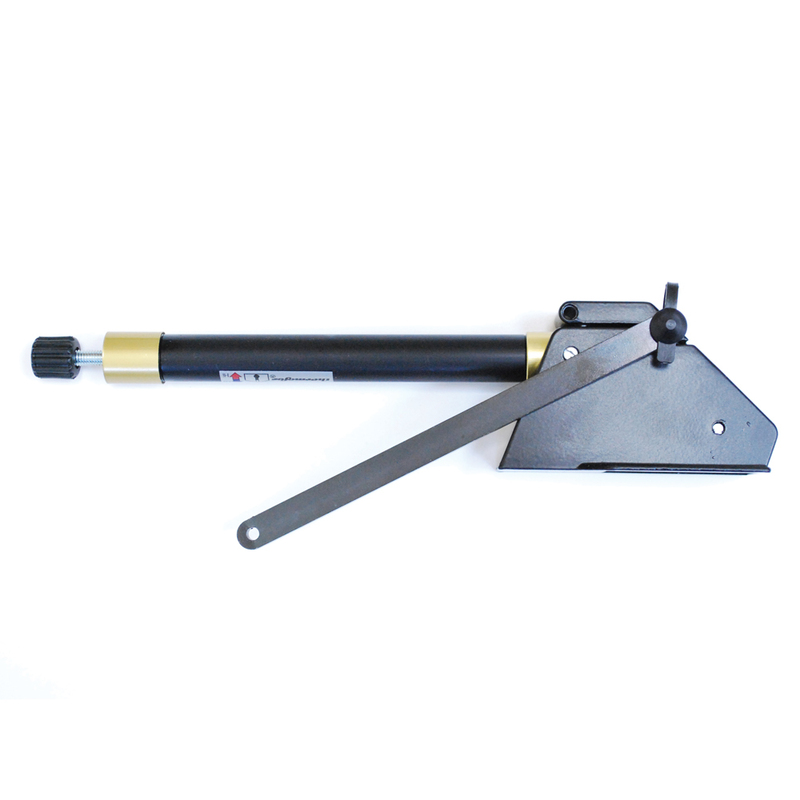 Auger Anchor, 30" Auger Anchor, 30"
Securely anchor your shelter to grass or unpacked soil. 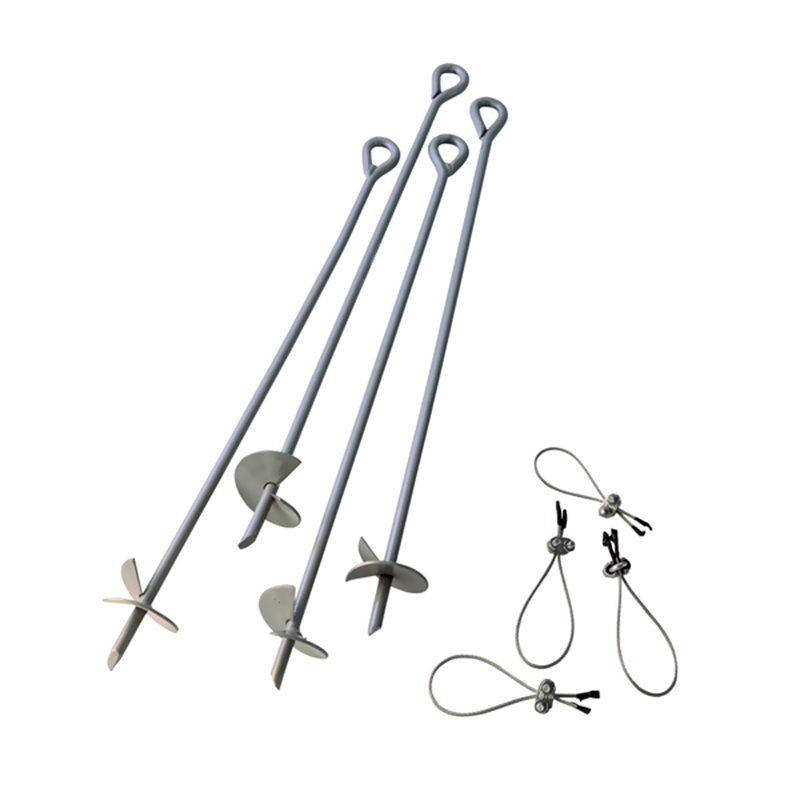 Genuine authentic anchoring for shelters, canopies and instant garages. Innovative corkscrew design digs in fast and holds on tight. Recommended for garages, sheds and larger canopies. • Portable and reusable - heavy-duty, powder-coated steel construction will not rust, corrode, chip or peel. 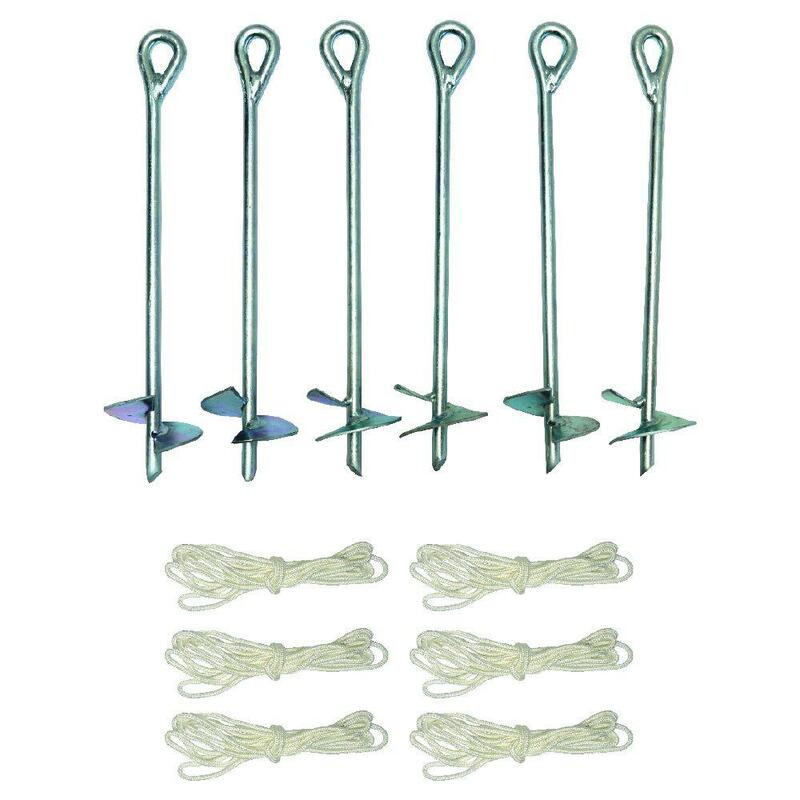 • Quick clamp-on wire tie-downs are installed in minutes to legs and anchors with a rock solid connection. • Proper anchoring of your shelter is mandatory. Make sure it is anchored securely to manufacturer specifications. The Automatic Louver Vent Opener was designed to automatically control the temperature and provide additional ventilation in all Rion Greenhouses. As the air inside the greenhouse warms, the vent gradually opens to allow the correct amount of air flow into the greenhouse and closes when the optimal temperature is reached. The vent arm was designed with the use of natural minerals that expand with heat to push a piston, which raises the window, as the air gets warmer then contracts as it cools, closing with the use of a spring. The Automatic Vent Opener operates without the use of electricity. The Automatic Vent Kit conveniently opens the window vent in your Palram Hobby Greenhouse. It is easy to install and no electricity is required. There is a liquid in the cylinder that expands as the temperature nears 70 degrees causing the vent to open. As the temperature drops the vent will close. Let the Auto Vent do the work for you. 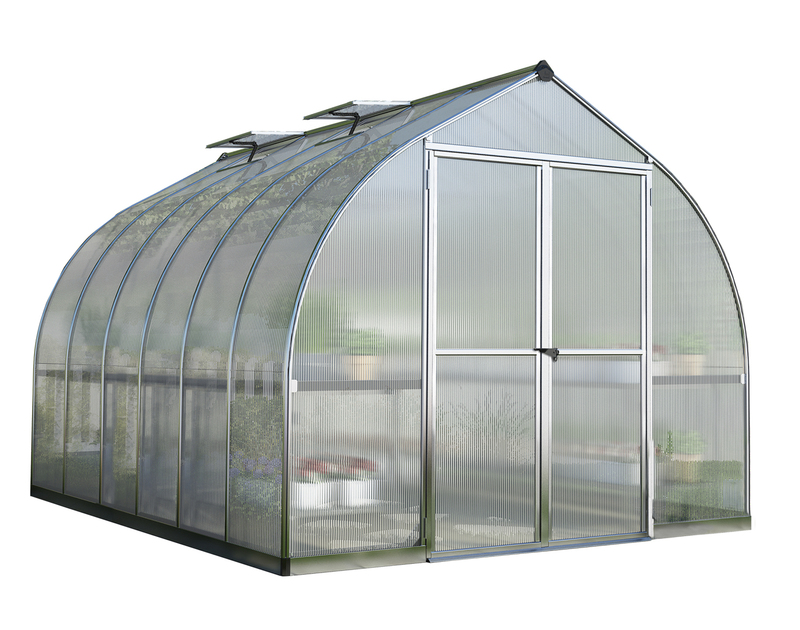 The Palram Balance series greenhouse brings hobby gardeners the best of both worlds; advanced light management through two different polycarbonate panels and a durable 8� foot wide frame perfect for your backyard and growing needs. 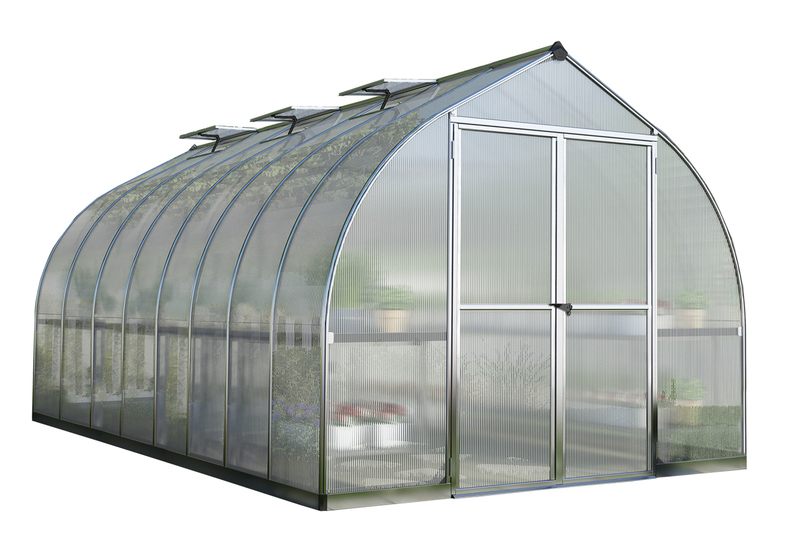 Beauty and mechanics are the main focus in Palram�s latest hobby greenhouse. 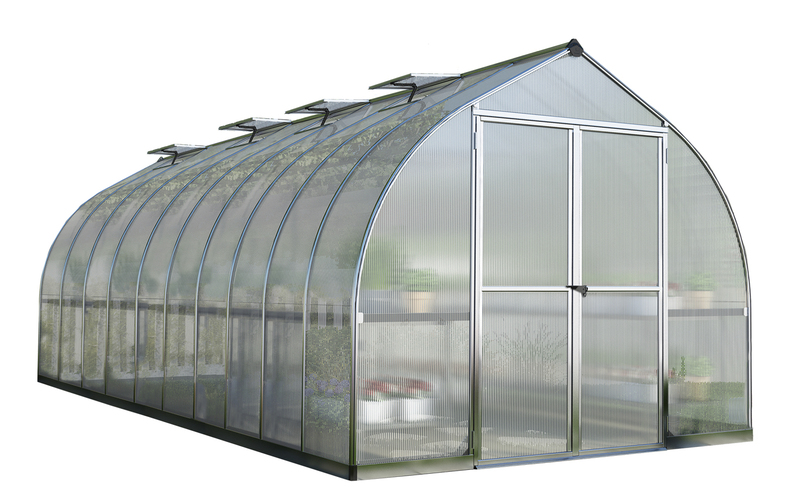 Welcome the Bella, an elegant and stout addition to your growing space designed for extending your season.With an 8� wide frame and four available lengths, you are able to customize the perfect hobby greenhouse. Beauty and mechanics are the main focus in Palram�s latest hobby greenhouse. Welcome the Bella, an elegant and stout addition to your growing space designed for extending your season. 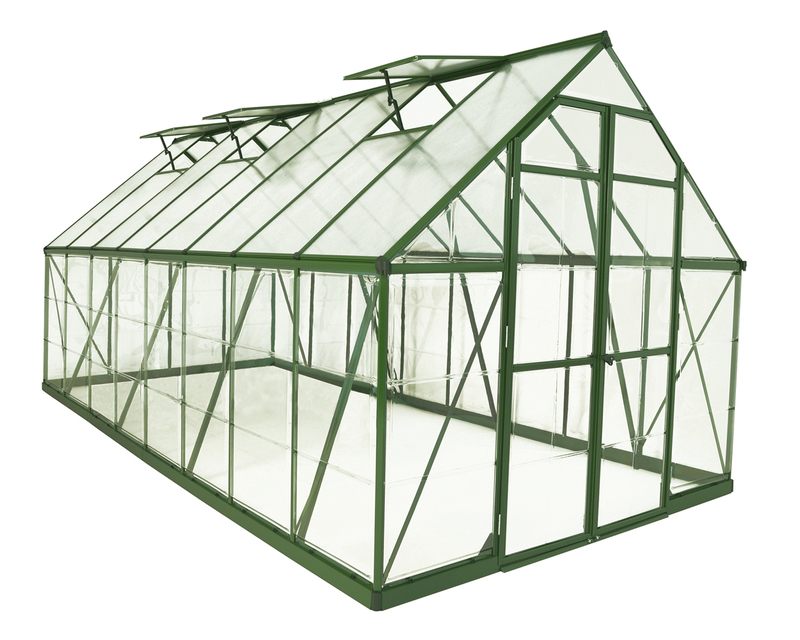 With an 8� wide frame and four available lengths, you are able to customize the perfect hobby greenhouse. 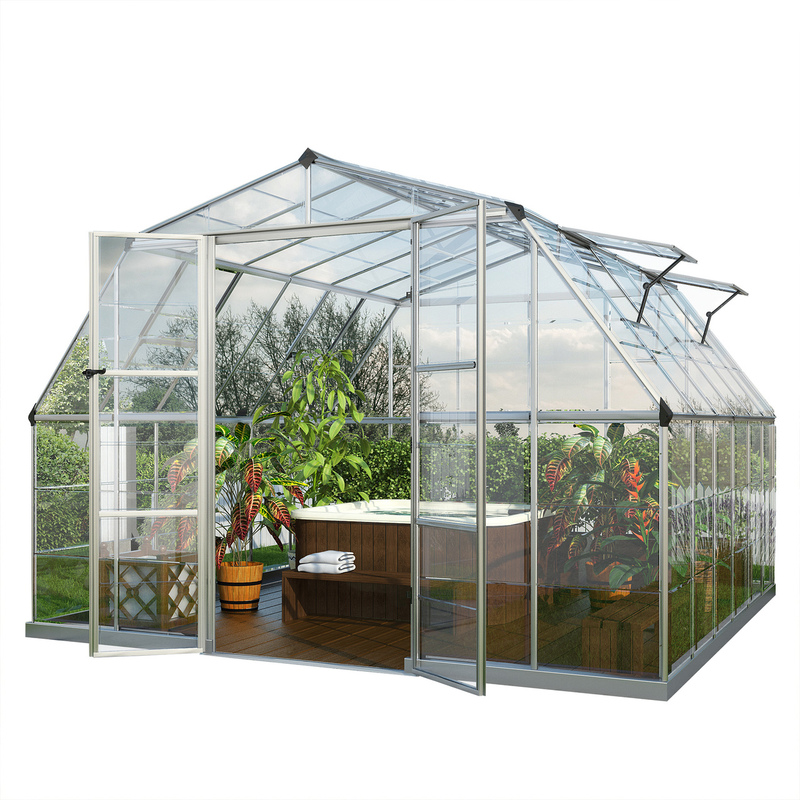 Beauty and mechanics are the main focus in Palram�s latest hobby greenhouse. Welcome the Bella, an elegant and stout addition to your growing space designed for extending your season. A healthy head-start on your garden begins with effective light management through Palram�s market leading twin-wall polycarbonate. Twin-wall polycarbonate is the leading choice for quality hobby greenhouse coverings because of its durability, light diffusing properties and heat retaining ability. The twin-wall roof and side panels on the Bella block 99.9% of harmful solar UV radiation and create a system of even-light. Even-light helps maximizes plant growth and eliminates the risk of plant burn and shade areas. Palram�s version of this virtually unbreakable polymer is made only with virgin materials that won�t become brittle or discolor over time. The bell shaped aluminum frame not only adds an elegant look to your backyard, it reduces wind impact and snow build-up. 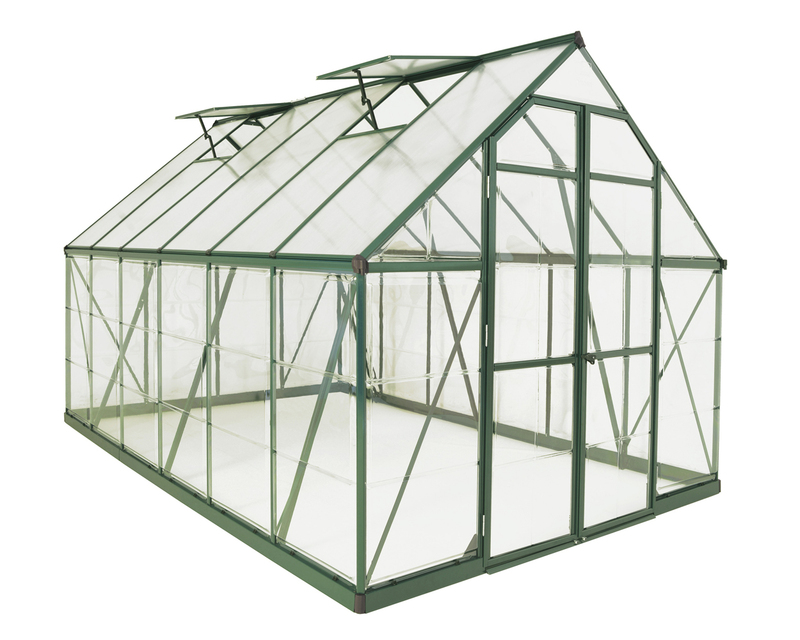 With an 8� wide frame and four available lengths, you are able to customize the perfect hobby greenhouse. Corrosion resistant and durable, keep your focus on growing and not maintaining. A 5 year limited warranty and US based customer support will give you piece of mind. 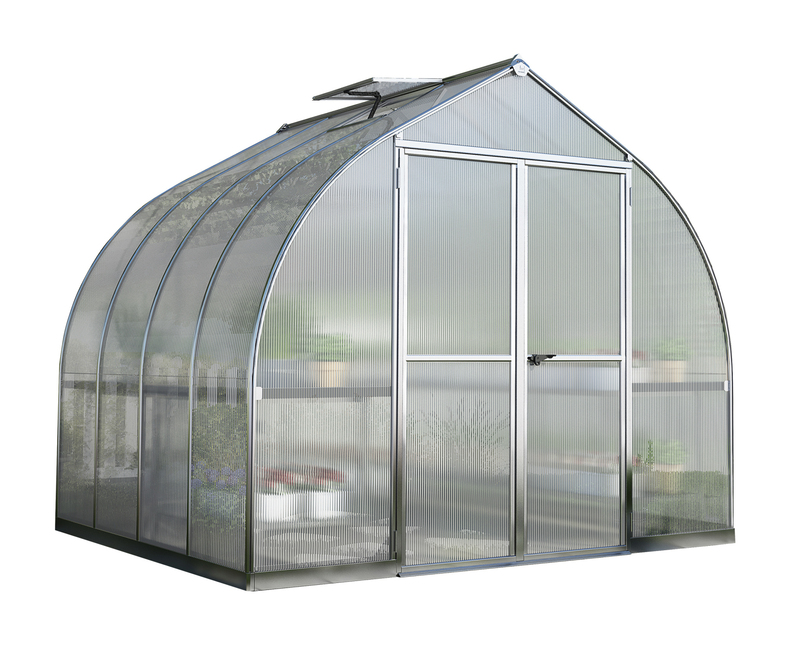 The cathedral design of the new Chalet greenhouse makes it elegant enough for leisure time and roomy enough for all of your gardening projects. Vaulted ceilings provide plenty of space for trellising and over 8 feet of headroom. Two vent windows and hinged double doors allow abundant air flow throughout. Rust resistant aluminum frame and virtually unbreakable polycarbonate glazing are low maintenance and durable for years of enjoyment. 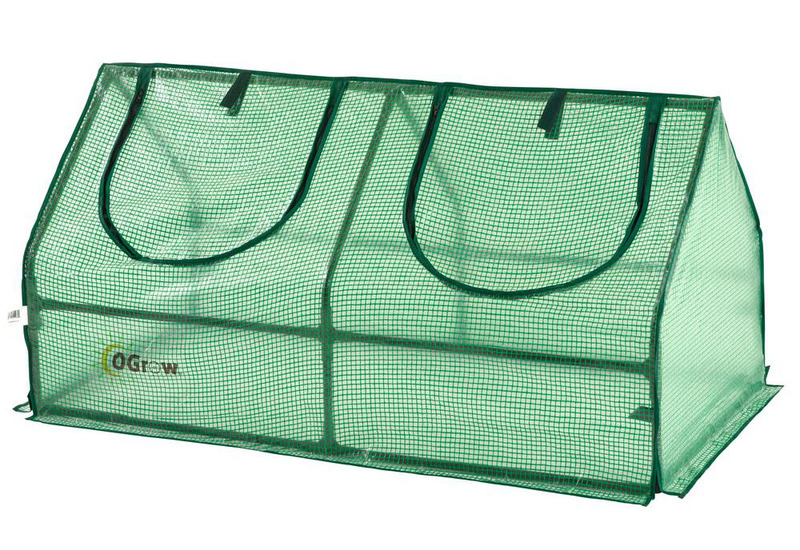 Any garden can accommodate this Ogrow Ultra Deluxe Compact Outdoor Seed Starter Greenhouse Cloche. 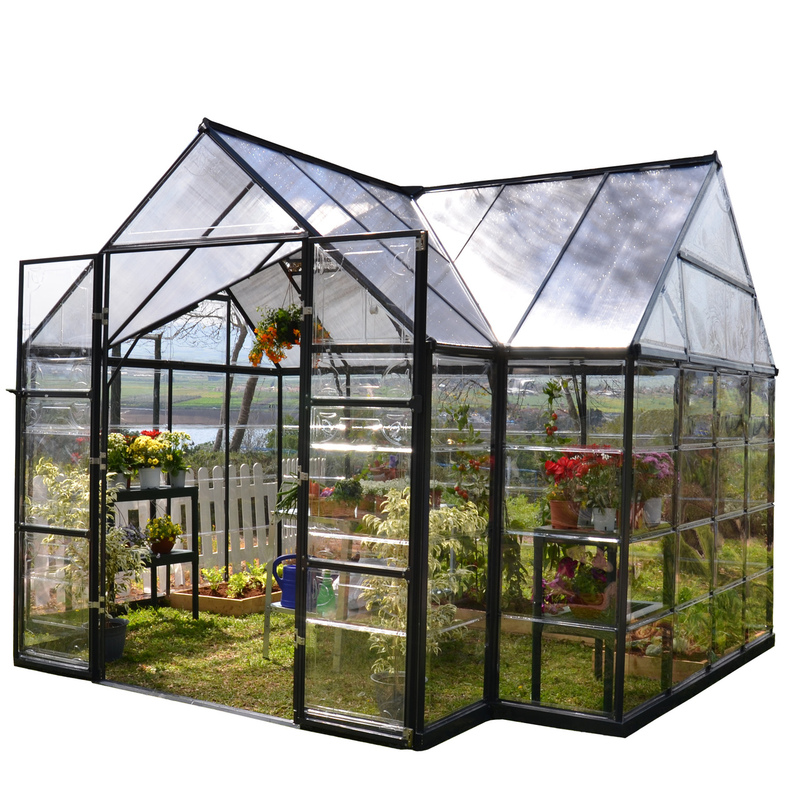 Yet, this greenhouse is the perfect solution for those smaller gardens that cannot accommodate a standard greenhouse. 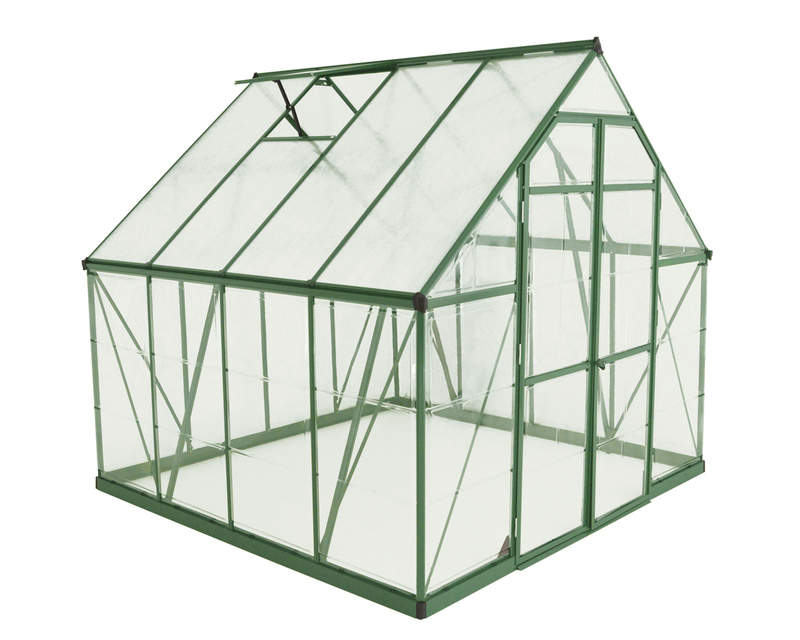 Our greenhouses are affordable, lightweight and easy to assemble. 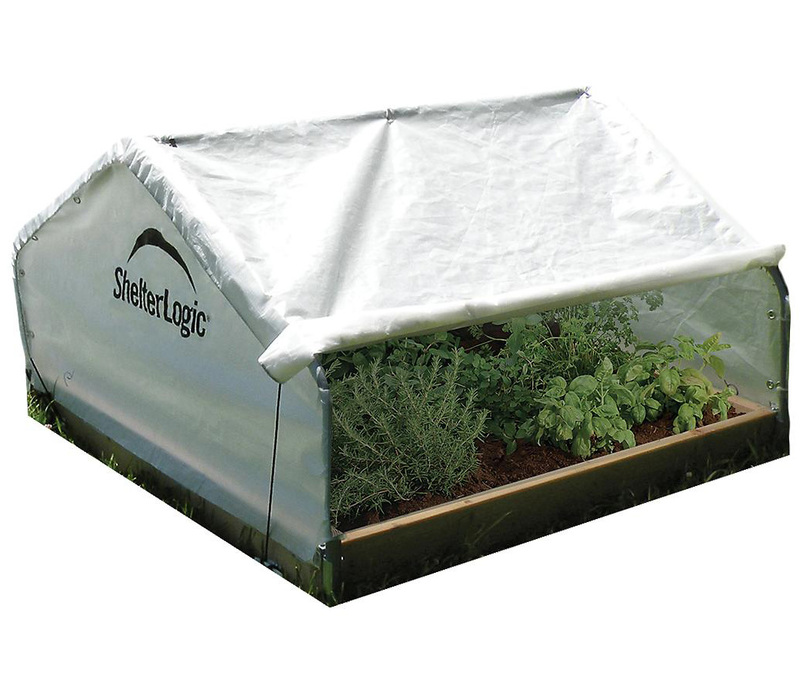 It will protect your plants from too much heat or cold, shield plants from dust and gale. 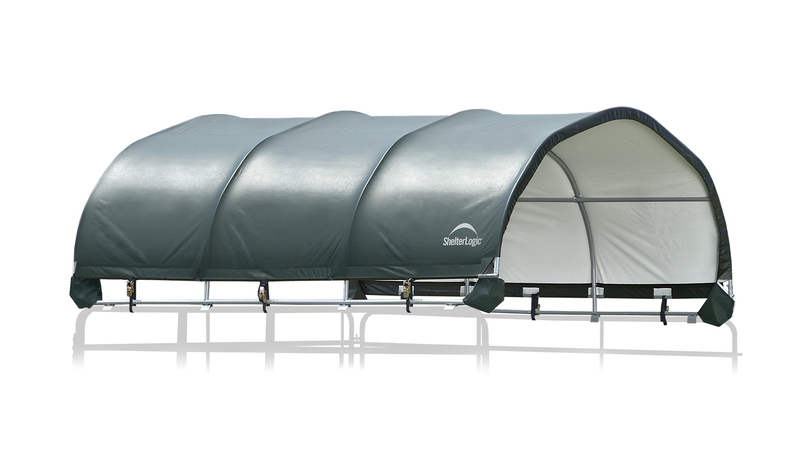 It has a strong powder coated steel frame and PE cover with zips for easy access and ventilation. Its heavy duty green PE plastic cover that gives you extra protection against direct sunlight ensures years of reliable use and won't fade or crack in sun. Connects with Velcro vs. ties that other greenhouses offer thus giving you easier assembly and long lasting durability. No hardware needed for assembly! Designed with special heavy duty high quality plastic connectors for easy assembly. The purchase includes clear setup and care instructions. Get growing today and let Ogrow help you bring your green dreams to life! 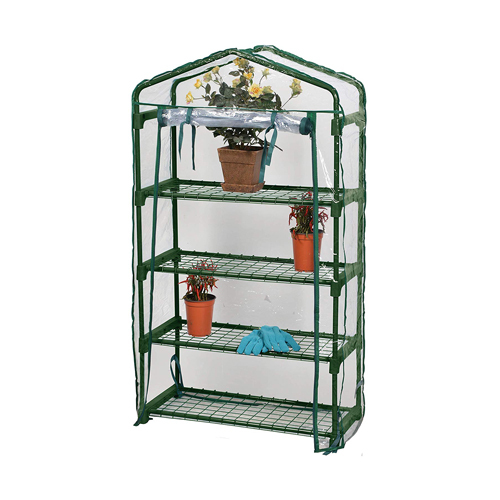 Compact Walk-in Greenhouse is ideal for limited spaces Shelving included Includes wall fixing rings and guy ropes. 4' 8" deep x 4' 8" wide x 6' 5" high. This item cannot be shipped to APO/FPO addresses. Please accept our apologies. 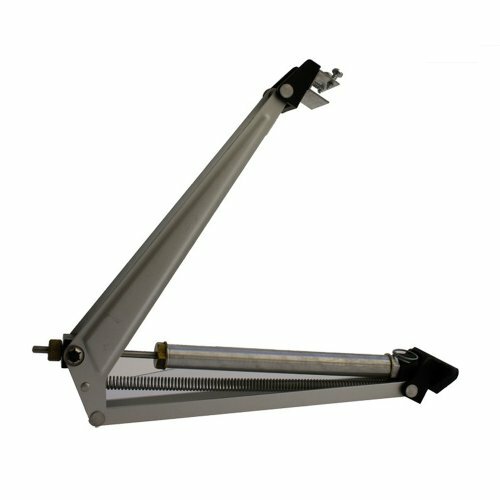 Heavy Duty Anchor System includes six galvanized steel auger type stakes for improved stability of your Domain carport.